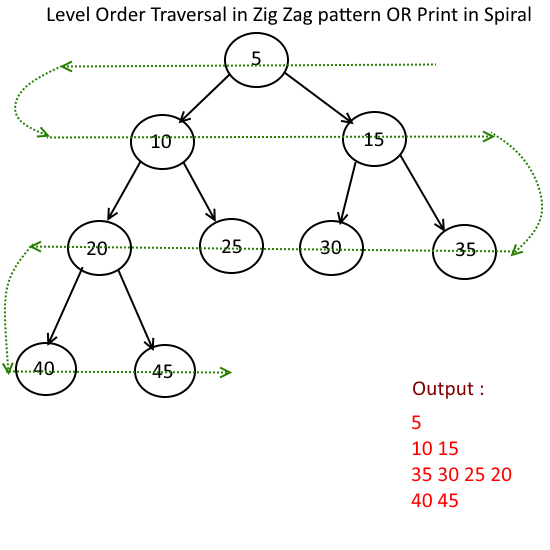 Output: Order Traversal in Zig Zag pattern OR Print in Spiral. Idea is to take all nodes at each level and print them forward and reverse order alternatively. Now while levelNodes>0, take out the nodes and add it to the array list and add their children into the queue. Alternatively print the array list in forward and backward order. Next story Find all common numbers in given three sorted arrays. 235 queries in 0.121 seconds.